Hello! 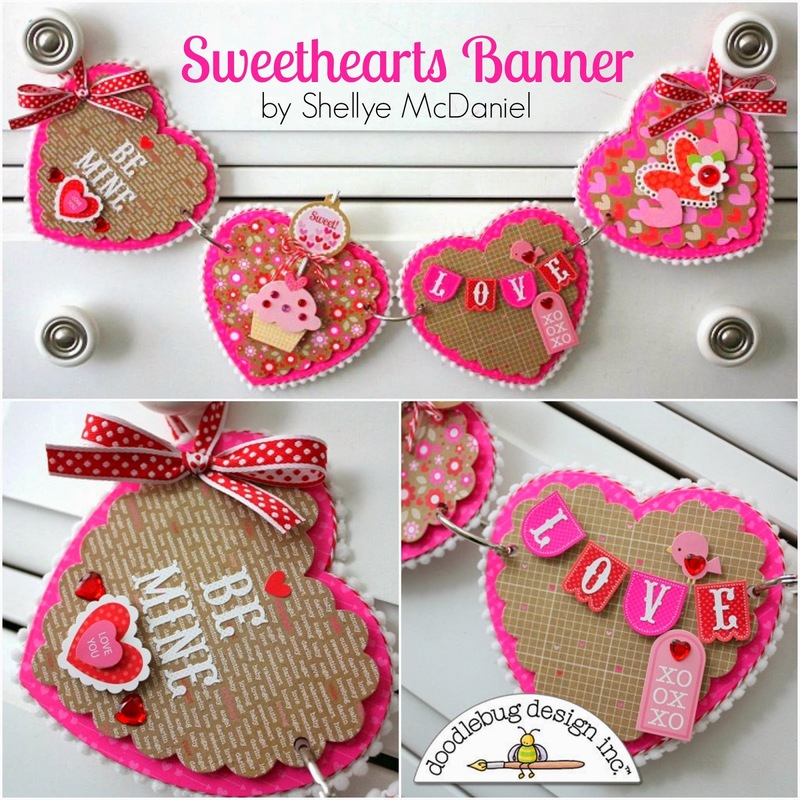 Shellye here to share a cute chipboard banner made with the "Sweetheart" Collection and a couple of fun layering dies. First, I die-cut the heart shape from pieces of medium weight chipboard. Next, I cut all of the base papers from the same patterned paper and then layered each with a coordinating pattern in a scalloped shape. Each heart was embellished with various Doodlebug Design finds like Doodle Pops, Doodle Twine and cardstock stickers. The Love Letters alphabet stickers are the perfect size to top the banner shaped stickers! And what is a cupcake without a "sweet" Pixie added to the top? After embellishing all of the panels, I applied Doodle Twine around the edge of the chipboard. Next, I glued on some whimsical pom pom trim by May Arts Ribbon. I used a crop-a-dile to punch holes at the sides and then added large rings to hold them together. To the ends, I strung through a loop of ribbon and then glued a bow onto the front. Banners are a fun way to dress up a cabinet, above a doorway or across a shelf! Thank you visiting the Doodlebug Blog today! This is so adorable Shellye!!! Love everything about it! Super adorable! Love all of the fun and colorful embellishments! Great use of the rings to hold the pieces together! so very cute!! love it tonnes!